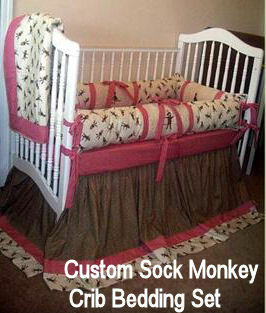 When you hear the term custom baby bedding, the first word that pops into your head is EXPENSIVE, right? When a mom in your group says that she has had her baby's crib bedding custom made doesn't it make you just a tiny bit jealous? 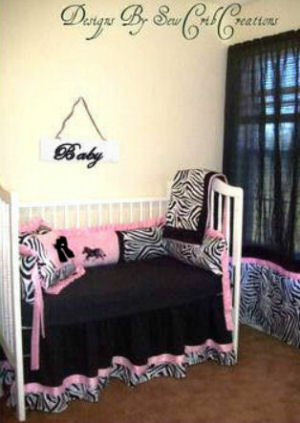 Well, you may be pleased to learn that you can be the next mommy to announce that she has had her crib set custom made. I'm about to tell you how you can get a set of boutique nursery bedding for a very cheap price! Certainly, some sets of custom made crib bedding and curtains for the baby’s nursery can be expensive, but there are ways to keep the cost down and still get the luxurious look for a fraction of the cost. In fact, you may find that if you play your cards right, you can create a luxury nursery and decorate it for a relatively inexpensive price. You can even have your bedding made in the same high end fabrics you see in the upscale baby bedding boutiques if you're a frugal and savvy shopper who doesn't get hung up on the latest in designer fabric. The color and pattern possibilities are endless and as far as what might be consider in vogue at any certain time, well; fashion is an ever-changing landscape. Some things never go out of style and damask is one of those things. You might wonder why anyone would bother with having your bedding custom made when there are so many designer sets for sale in baby boutiques. It's true that there are zebra print crib sets for sale in the stores but none as fancy as one made by an independent seamstress or online vendor. Specific fabric patterns are such as zebra stripes are lovely but themed sets are very popular as well. The vintage Sock Monkey nursery theme might feature a neutral design in traditional colors or have a feminine color scheme of pink and brown. Another example of a bedding collection featuring an icon that can be made girly or masculine would one made using fabrics displaying the classic John Deere logo. 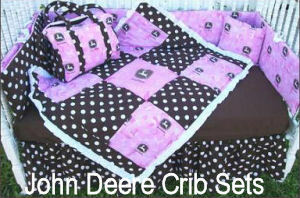 Pink and brown John Deere fabrics are very pretty when paired with polka dots and other graphic prints. The logo in bright green with pink accents is another option. WHY WOULD CUSTOM BABY BEDDING BE NECESSARY? If you have your heart set on using that antique baby bed or cradle you may find that nursery bedding sets found in the stores just don’t fit! Standard furniture sizes change through the years and manufacturers mass produce their bedding collections to fit the size of the day. The only option available to a mom decorating her baby’s nursery using an heirloom crib might be to have a set of custom baby bedding sewn or to sew the baby bedding herself. A special crib mattress might be needed as well. Have your crib mattress on hand before contracting your bedding for a perfect and safe fit which is crucial! So you just did a complete bedroom makeover only to find out that the space would be needed as the baby’s nursery and you can’t find a single crib set that will work with the wallpaper or flooring. This is a case where a set of custom baby bedding would be cheap in comparison to hanging new wall coverings and buying new flooring for the bedroom. Believe me, when you approach your husband with the prices of new carpeting and wallpapers in hand compared to your dream set of custom baby bedding, he will crumble like a cookie! Here's your chance to put your ideas for unique and different nursery themes and nursery colors to good use! 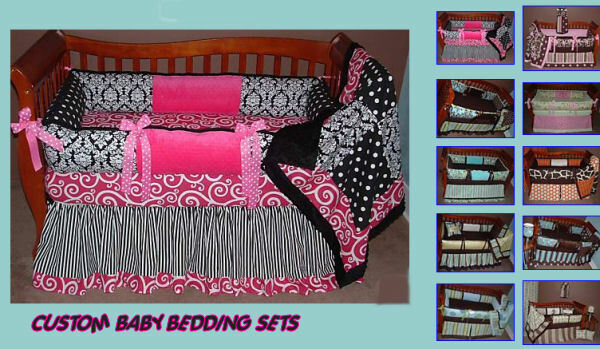 Those are few reasons that you may need to design your own custom made baby bedding sets. Now, here are some ideas on how to go about designing your custom baby bedding or having it professionally sewn. With your chosen fabric, measurements and specifications in your hand, get estimates from some highly recommended seamstresses. If you have had the luxury of actually examining a set of custom bedding from any given design studio and know it to be of acceptable quality; bump that designer to the top of your list. Get a detailed quote that lists all pieces that you expect to have made in writing from each seamstress. Ask that the required fabric yardage necessary to complete your custom baby crib bedding be listed as well and be sure that you have a few yards extra in case an accidental slip of the scissors should occur. Custom baby bedding fabric can be expensive, so be sure to get any lengths of material left over to use as nursery rocker slipcovers, window valances or even some unique baby gear and nursery decorating ideas to give the entire room a polished look and feel just like the ones we see in the pictures of professionally decorated baby’s nurseries in the magazines.